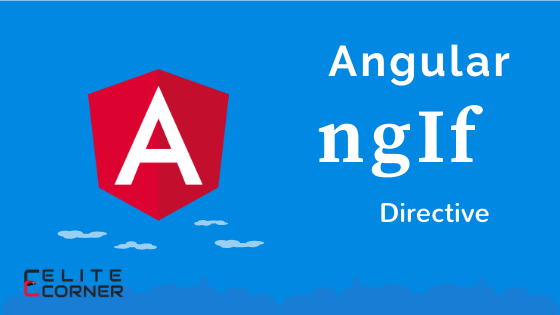 In this article, we'll see how to user Angular's ngIf, with then and else block. ngIf is angular's builtin structural directive the adds or removes the part of the DOM based on the value supplied to the ngIf directive. If the value is true, Angular renders the part of the DOM and if false then remove the part of the DOM. ngIf show or hide the part of the DOM based on the condition value. Based on the value of isLoggedIn flag, the template will show the different message. The template reference variable name should be the same as whatever we defined in the else block. Here we've define elseBlock in the ngIf's else block, that's why we've used elseBlock as template reference variable. ng-template is the virtual container. that means that it will be rendered only if it is needed, so in this example, it will only be rendered if isLoggedIn is false. Now we'll see how can we use ngIf with rxjs observable. Where can we use ngIf directive? We can use ngIf directive in any HTML tag or even we can use it with the angular component as well. ngIf directive is very usefull for null checking. If we are accessing the property of the object, it will throw an error if the object is not available. It usually happens when we are getting data from the server and data is not available until server responds with. So in that scenario ngIf is useful for null checking. Here in the above code, we are accessing Email property from user object. Imaging what if user is null. Angular will throw an error if user is null. That's why we've checked if user is available then access Email property.